What else can you do at Saduak Floating Market? About an hour outside of Bangkok, Thailand, lies a market so unusual that it’s worth visiting for the spectacle alone– the floating markets of Damnoen Saduak. At the floating market, hundred of vendors tucked into small wooden boats crowd a narrow canal, hawking their wares to anyone who walks by. While the scene sounds practically Disney-esque, the Saduak Floating Markets aren’t a made-for-tourists gimmick, but a continuation of a centuries-old tradition. Bangkok and its environs were once the Venice of Asia, connected via a network of intertwining canals and rivers. Out of necessity, vendors navigated the canals via boat, selling their wares along the way. While today locals can buy goods on dry land, an influx tourists has kept the Saduak floating markets thriving. In this post, travel writer and round-the-world adventurer Agness of E-Tramping shares her photos and insider tips on how to navigate Thailand’s Damnoen Saduak Floating Market. Prepare yourself for insane crowds at the floating markets, as hundreds of thousands of tourists cram into these narrow lanes each year. 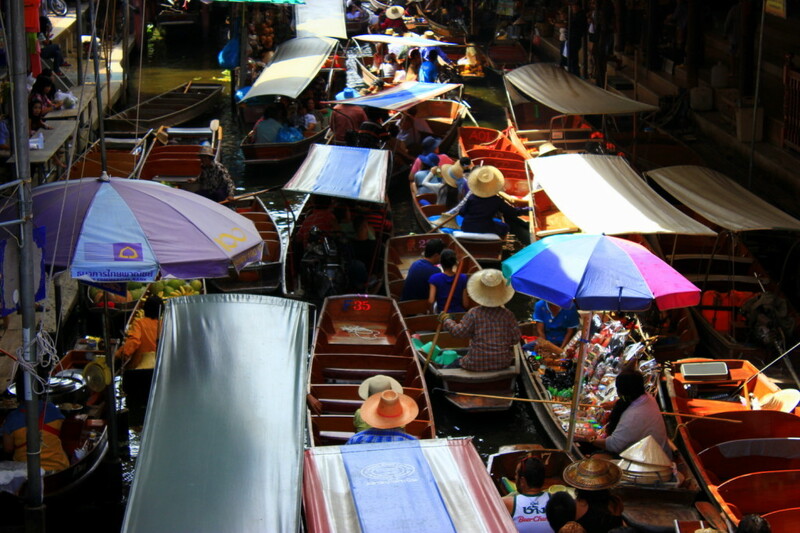 But even with the crowds of tourists, the Saduak Floating Markets still manage to retain an air of authenticity. Filled with colorful, loud and chaotic scenes, the floating markets capture the vibe of a typical Thai market that visitors can’t help but fall in love with. It’s easy to visit the Floating Markets on foot– just walk along the sides of the canal and marvel at the rows of packed wooden boats, overflowing with fresh fruit and vegetables and traditional Thai souvenirs. Each boat is its own specialty shop, waiting to be explored. The Damnoen Saduak floating market offers a unique culinary experience you won’t find anywhere else. The wooden paddle boat vendors sell tropical fruits that you’ve have probably never eaten before (and maybe haven’t even heard of). You’ll also find traditional Thai meat and vegetarian dishes, along with sweet treats. • Thai dumplings stuffed with mince, fried onion and steamed veggies (about 10 Bath a portion). Bonus– they are served on plates made of leaves! • Thai ice cream – not too sweet, but very fruity – 25 Bath each. • Local fruits like dragon ball, durian, small bananas and delicious mangoes. Unsure of how to order? Just approach the vendors on the boats and request your favorite dish. Conveniently, the vendors will package your food in a takeaway plastic container (complete with utensils) so you can eat while walking along the canal. Or, if you prefer to relax while seated at a proper table, just carry your takeaway over to the Floating Market’s food court area. If you crave a bigger meal, then visit one of the small, local restaurants lining the river. Here, you can dig into a delicious plate of Thai goodness – Thai pancakes, dumplings, famous Pad Thai with peanuts or sweet seafood salad. 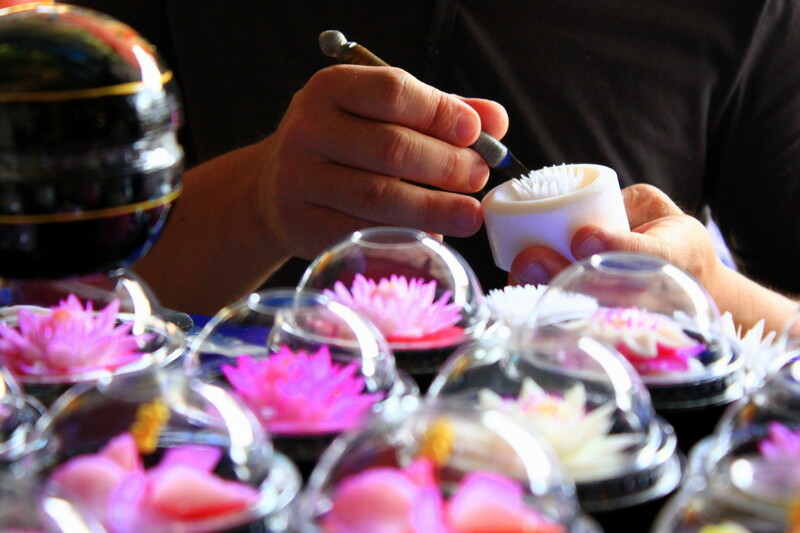 A vendor crafts colorful flower candles by hand. Styled properly, these traditional Thai souvenir conical hats could make a chic accessory back home. Visiting Damnoen Saduak floating market and leaving without a single souvenir is just impossible. Hundreds of vendors want to sell millions of cheap Thai souvenirs so you are literally forced to buy something whether you like it or not. Fortunately, mixed in with the cheap tchotckes, post cards and t-shirts are some souvenir gems just waiting to be discovered. At first glance, prices might seem higher than you’d expect, but once you start haggling, you can usually knock off 50 or even 70 percent of the price. 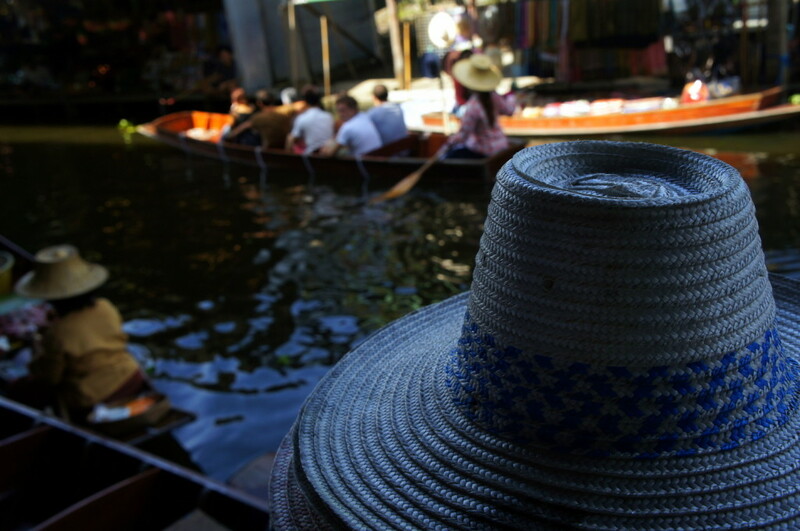 For example, the prices of Thai hats start from 180 Baht each, but you can bargain and purchase them for around 60 Baht. Similarly, t-shirts are listed at about 140 Baht each, but most tourists get them for around 45-60 Baht. 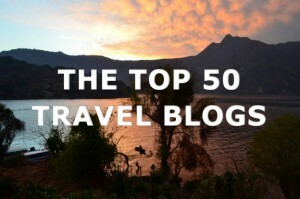 Apart from eating and strolling around the market, there are few more things you can do while visiting the area. For approximately 150 Baht you can cruise the market and the surrounding areas aboard a row/motor boat. The journey takes less than 35 minutes and takes you past colorful houses on stilts, giving you a glimpse of locals going about their everyday life. You may also be interested in posing with a Burmese Python draped around neck your for 100 Baht or cobra show for 400 Baht. What to buy: Skip the cheap trinkets and look for handmade hats and candles. 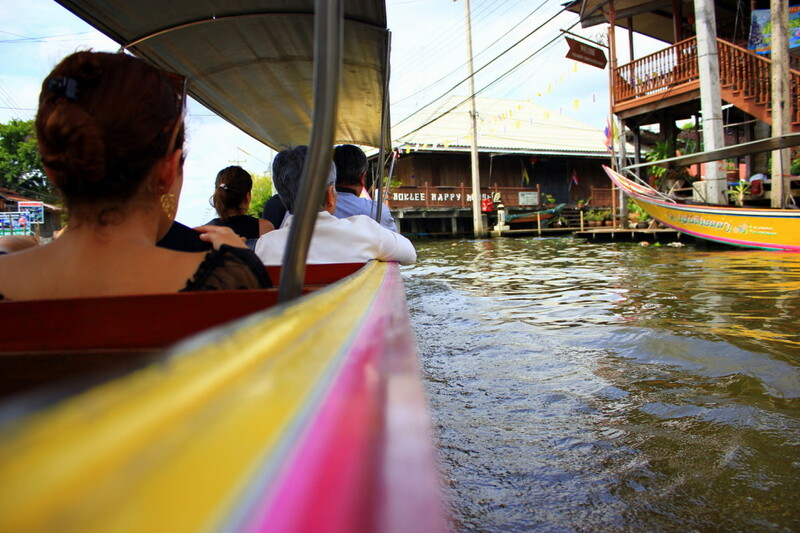 Where to Buy: Saduak Floating Market is about 60 miles from Bangkok (open daily from 8 am till 1 pm). You can get there via tour (visit one of the travel agencies in central Bangkok to book, approximately 17000 Baht per person), or use public transport. First, head to Southern Bus Terminal. Take a bus no. 78. It leaves every 40 minutes and the first bus leaves at 6 am. Ticket cost: 64 Baht each way. The bus will most likely drop you off around 1km away from the market. Walk (to the left of the bus station) for 10-15 minutes until you see the market. What to Know: the market can get insanely crowded so it’s best to hit it first thing in the morning. 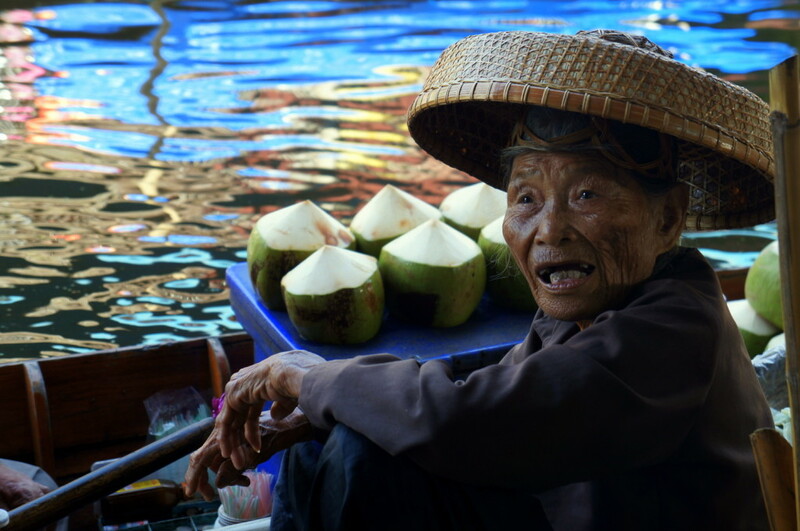 Have you been to a floating market in Thailand? 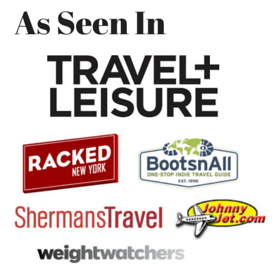 Share your shopping (and snacking) finds in the comments below! 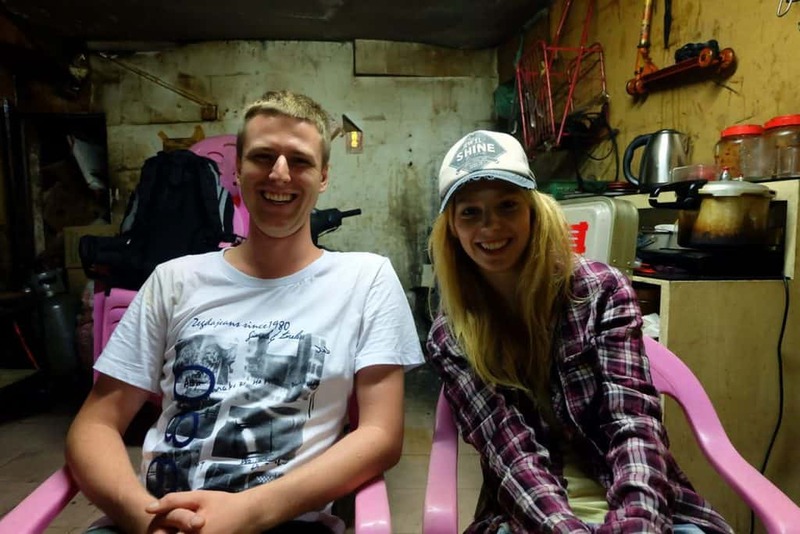 Meet the eTramping crew– Agness and Cez – best friends and travel companions from Poland. In eTramping, Agness and Cez share their budget travel tips on how to travel the world with $25 in your pocket. The couple has been travelling the world since 2011, teaching English along the way in different Asian countries like China, Thailand and Cambodia. They are both passionate about photography and obsessed with Chinese cuisine and culture. That is just the market that I was looking for when I was in Bangkok and I ended up at the wrong one (grr).. guess another trip has to be planned! Great post! I’ve heard so much about this floating market but I’ve somehow missed it on every trip to Thailand. I love the pics and your tips on how to order food and what to buy are excellent! I can’t believe I missed this market while in Bangkok! Don’t get me wrong, I went to me fair share 😉 Was it easy to get to?